A suspected impaired driver crashed into a Leavenworth home early Saturday morning, according to the Chelan County Sheriff’s Department. The incident occurred around 2:30 a.m. at the home, located near the corner of Ski Hill Drive and Benton Street. 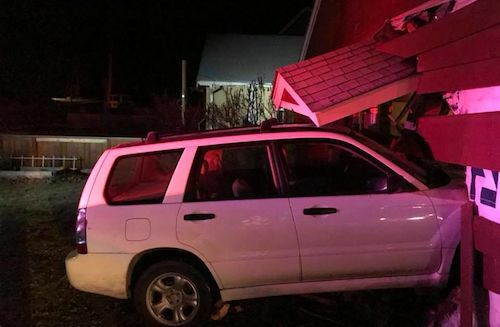 Police say a 19-year-old Leavenworth woman crashed her Subaru Forester into the living room of a Leavenworth home. She ran from the scene and officers had to be pursued for arrest. She faces charges of malicious mischief, hit and run and DUI. The crash sent debris flying. One man sleeping in the house was checked for minor injuries at Cascade Medical Center after he was hit by flying lumber. Other family members, including a 3-month-old baby, were not injured. iFIBER One News reports that repairs to the house will likely make it uninhabitable for six months or longer. In situations such as the one above, homeowners face medical bills and costly repair bills. Knowing where to turn and how to pursue compensation is key. The driver of the vehicle that crashes into the home is obviously the negligent party. You can open an accident claim with the car owner’s insurance — the insurer will only pay up to the limits on that policy. While these limits may seem high, in severe accident cases the long-term medical bills and rehabilitation can easily surpass the limits. Damages to a home cost more than damages to a vehicle, and insurance companies are notorious for paying as little as possible on claims. Their goal is to make money and pay out as little as possible. Having a personal injury attorney on your side could be the difference in your case. At Davis Law Group, our experienced injury attorneys understand the frustrations of getting fair financial compensation. Attorney Chris Davis and his legal staff are here provide you with guidance about how to best proceed with your case. Call us for a free case review at (206) 727-4000. You can also use the chat feature below or fill out the confidential contact form on this page.